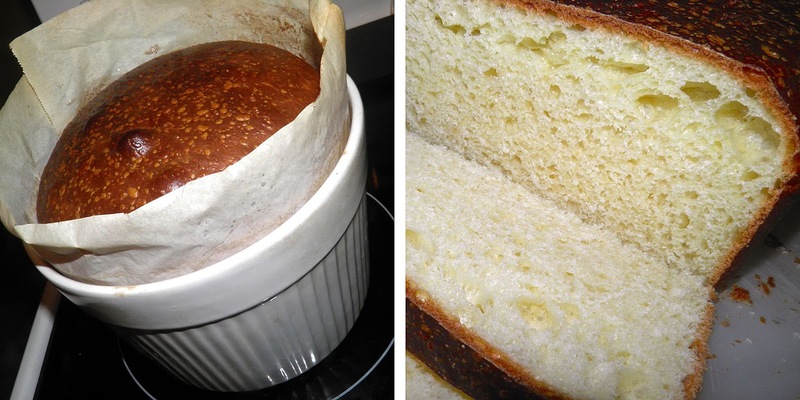 Devoid Of Culture And Indifferent To The Arts: Make Brioche with your mixer! The quote begs a very interesting question: what makes a recipe “authentic”? Is it ingredients, technique, location something is made? All are valid to argue in the positive and negative. Consider how you get down from a hilltop. You can walk, roll, bike, run, sled, ski, etc. The end result is getting down the hill in one piece. How you get there is of no great concern, really. It's the end result. The flour, sugar, yeast, salt and butter. The same is true with making brioche. It has to be rich and buttery, with a moist, tender crumb. But it's a French classic – it must be difficult. As with all classic French recipes, there’s more fear and mystery surrounding how to make them than is necessary. But for a moment, let's talk original. As far as “authentic” goes, look no further than Julia Child. She uses a spatula and her hands. (Of course she would!) I would imagine that is exactly the way she was taught when she was studying cooking in France. If you want to read how she does it, look here. 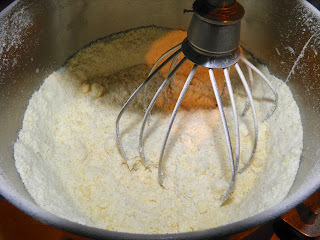 Interestingly, the method of choice nowadays is a mixer with a whisk and dough hook. Many fine dining magazines have published recipes that use that most useful kitchen tool. If it’s good enough for Fine Cooking magazine it's good enough for me... So I don’t feel that guilty in using my KitchenAid to help me out. Otherwise I would be in for a bit of a mess. The "paste." before first long rise. Before being baked, brioche is part dough, part paste, or “pâté de brioche.” Luckily my excursions in overnight raises have conditioned me for what to expect from an 8-hour bread rise. It’s substantially different than when first started. A few sites lament about “fast” brioche recipes common nowadays where the flavour is not allowed to develop before baking. This also is solved by the overnight rise. The length of time lets “yeastiness” develop that 2-3 hours just doesn’t deliver. I made this recipe because I was bored one night this week. If it failed all I would be out was a few cups of flour, some butter and eggs. No big deal. That’s the good thing about baking. If it’s a flop you just throw it out. Luckily this was not. Any fear I may have had about making brioche has now completely evaporated. It’s no more difficult than any other bread. This was delicious warm and plain, and the next morning toasted with butter. It can be used to make excellent French toast, or even sandwiches. The dough itself can be shaped into rolls, as lining for tarts, or rolled into croissants. They can then be broiled briefly with French pastry cream and almond slivers. Versatility at its finest! Settled in for 2nd rise. Dish is 8" wide x 5" high. 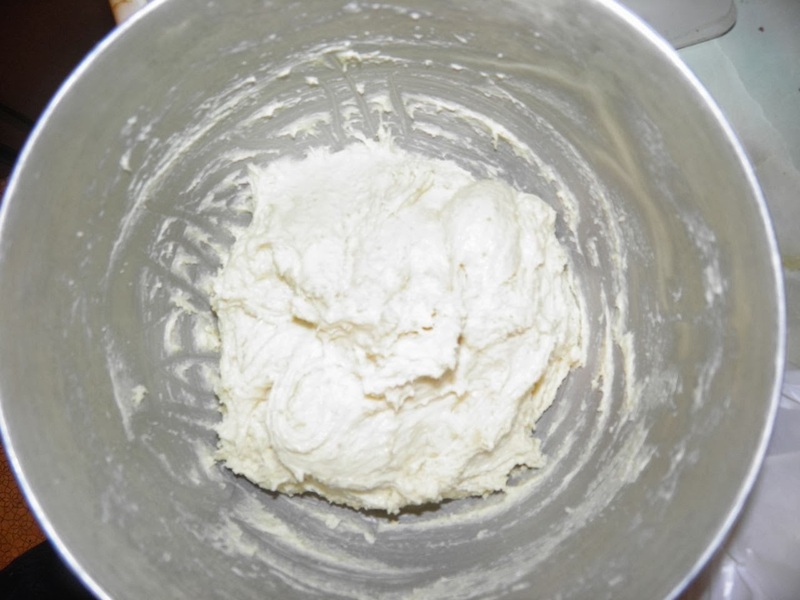 Place the flour, sugar, yeast and salt in the bowl of your mixer. Using the whisk attachment, mix the dry ingredients together. Switch the whisk for a dough hook. Then add the milk and water. Beat the dough until it comes together in a mass, but is very sticky. This will take a couple minutes. Remove the hook. Scrape down the sides of the bowl so all the dough is together in one mass. Cover with plastic wrap and a towel. let rise overnight, or for 8 hours. After the first rise, butter your hands and remove the dough to a board. Using a small amount of flour, knead briefly to make the dough smooth. It will still be very moist but will not stick. 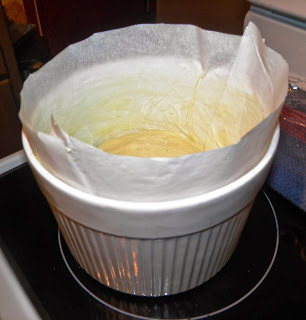 If using a circular baking dish (like I did), butter it well, line with parchment paper 1” up past the sides and butter the paper. Place the dough in the dish. Let the dough rise again for 3 hours. It will almost triple in size. Preheat the oven to 400°F with a pan (with 1 cup of water in it) on the bottom rack. Brush the loaf (or loaves) with the cream. Bake the small loaves for 30-35 minutes, or the large one for 1 hour. The loaves are done when they are well browned on top and sound hollow when tapped. 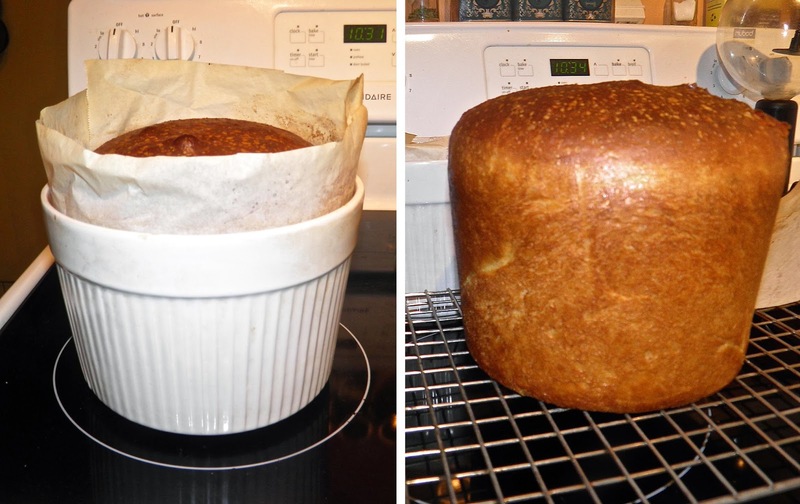 Note: the large loaf can be tricky because of its size and the dough moisture content. The very centre has a tendency to cook very slowly. That’s why the time is twice that f the smaller loaves. Remove from the oven and the pans, and let cool.